The Dietrich Theater was built in 1936 by George Dietrich and continued to show movies for nearly fifty years. In the late 1980's, bowing to the whims of the times, the local theater could no longer compete with the mall movies, and the screen became dark. In time the building would fall into terrible disrepair with severe roof damage adding to its troubles. 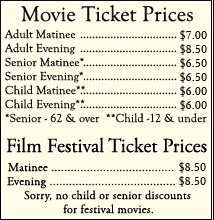 In March of 1998 a small group of Tunkhannock residents met to discuss the purchase and renovation of the historic theater. The group felt, from various conversations about town, that most people were sorry that the local theater had closed and would back a concerted effort to re-open it. The owner of the building had told the group that he would hold the mortgage on the building and would sell it to them if they could raise $34,000.00 dollars in six weeks as a down payment on the building. The group agreed and met with the local newspaper to see if they would give coverage to this story. The paper ran a front page story telling people what the group had decided. If the public would send the down payment then the group would purchase the building, apply for their 501C3 non-profit status, and attempt to write grants and raise the other monies necessary to re-open the theater. If the needed amount of money were not raised, all donations would be returned to sender. Within five weeks, thanks to a generous contribution from Mary Evans, the total was well over $50,000.00. In May the newly formed W.C.C.C. purchased the building and a new roof was immediately put on. From then on it was a matter of writing grants, talking to bankers, hiring a building designer and taking bids from contractors. Because there is a chain of non-profit theaters in the neighboring county, we sought advice from them whenever possible. One of the recommendations their Executive Director made was that the Dietrich be divided into two theaters because with 400 plus seats, it was a behemoth in this day and age. We decided to follow his advice and had the designer plan two theaters, one that would hold 213 and the other 87. The two theaters enable us to bring in films that appeal to two entirely different audiences. The construction part of the project took just under two years. Finally, with the mortgage now guaranteed by a USDA Rural Development Loan, the theater opened its doors on Friday, April 13, 2001. And, since it was Friday the thirteenth one of our projectors blew just as it was being set up to show Chocolate. Try as we would, there was no way to fix it that week, so we had a rocky start, but that was the first and last time we had major trouble with any of our machinery. The Dietrich shows countless blockbuster, foreign, independent and classic films. The theater has also presented over 100 cultural events, including semiannual film festivals, live theater, concerts and workshops. The semiannual film festivals bring in patrons from all over northeastern Pennsylvania. Wonderful works of art are exhibited in our William Norris Earnshaw Gallery, and art classes are offered in the Dorothy G. Sheldon Art Studio for both youth and adults.